To start off this section, we should note that a regulation backboard is 72 inches wide and 42 inches high. Most basketball systems, however, do not have this large of a backboard. There are a large number of mini basketball hoops available, which we will not consider. We will consider basketball hoops made by Lifetime Products, Spalding, Huffy, Goalsetter, and Goalrilla product offerings that have systems that can have the rim reach 10 feet. 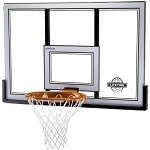 In this group of available basketball systems, backboards widths can be as small as 44 inches wide and as big as a regulation-sized backboard. Here are some more details for each size group. 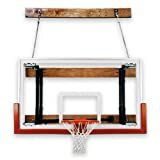 Small basketball backboards are typical on basketball hoops priced under $300. These backboard systems will normally be made with plastic, polycarbonate, or acrylic. 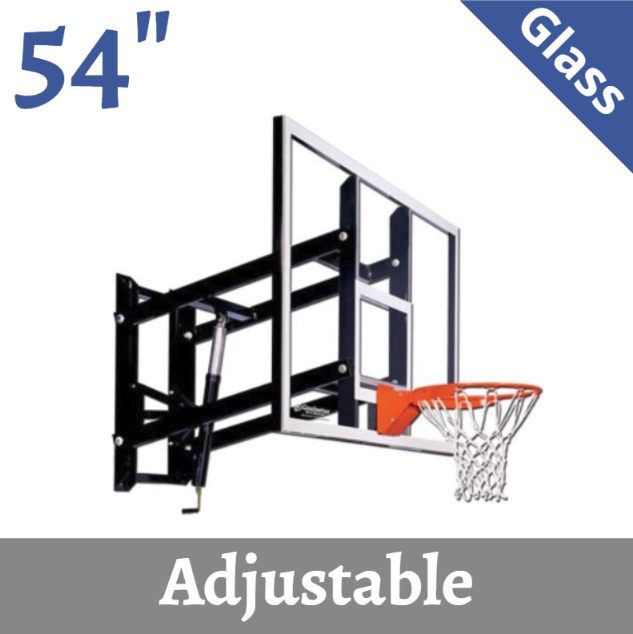 For these backboard sizes, they are available on in-ground, portable, and wall-mount basketball systems. The poles on the in-ground and portable system options will normally be 2.75 inches to 3.5 inches round. These mid-sized backboard encompass systems in both the high end and low end of systems. 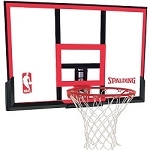 Basketball hoops with these backboard sizes are typically priced between $300 to $1199.00. In the cheaper part of that spectrum, the backboards will be made of polycarbonate and acrylic. Those systems with these backboard materials are normally priced below $499.00. Where this backboard size category shifts into the higher-priced systems is when the backboard material is tempered glass. All of the above-mentioned manufacturers will have tempered glass backboard systems in this size category. 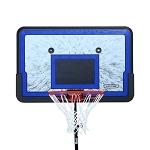 These basketball backboards are almost exclusively made with tempered glass, with a few acrylic backboard options. Systems with this size of backboard are also almost exclusively in-ground goals, with only a couple of portable options. Goalsetter, makes a wall-mount backboard system in both a 60-inch and 72-inch backboard size. These basketball systems will also have larger poles (for in-ground and portable options). These poles are typically 5x5 inch and 6x6 inch sizes, with a couple of options with an 8x8 inch size. Will resume shipping around 5/31/2019. Getting the right backboard for you system is important for helping you fully appreciate your system. Once you have sufficiently researched the type of system that is right for you, buy one And enjoy! It is critical that you make sure you get the right backboard that will suffice for your circumstances. Make sure you check out all of the different options before hurriedly buying a random one. Take your time, and make sure you are getting the best hoop for you. If you want cheap, check out the small backboards, and make sure you find yourself one that is good for you. If you want higher quality, check out the medium and large sized backboards. No matter what hoop you get though, it will be high quality and made to perfection. Just make sure you get the right one for you.